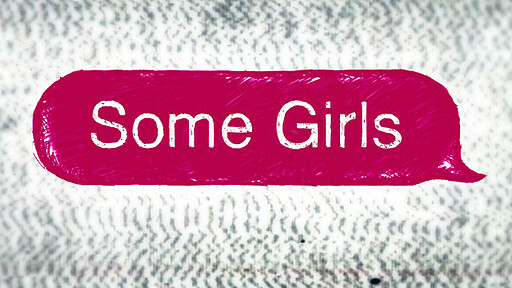 Some Girls Season 1 DVD Review With a second season in the works, hopefully the scripts can match the caliber of the acting and Some Girls can realise its untapped potential, but at the moment the show serves only as a brief distraction and nothing more. 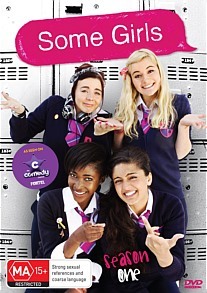 Touted as kind of a female equivalent of The Inbetweeners, Some Girls follows the exploits of four teenage friends from the same inner city estate as they navigate the perilous trials of adolescence and school life. The characters, much like the concept, are analogous to those from The Inbetweeners: Dopey best friend Amber, foul mouthed Holli, the sardonic Saz and Viva, narrator and the lynchpin that holds this motley crew together. Much of the show centers around their school football team, boy troubles and their acrimonious relationship with their Kiwi coach Anna, who also happens to be Viva’s stepmother. Throughout the series the girls compete in a mixed gender soccer match, steal the school’s pet Hamster, contend with Amber’s rocky relationship with on again/ off again flame Brandon, conspire to help Saz lose her virginity and encounter a hobo with a predilection for pooping in elevators. As you can probably imagine from the description above, Sweet Valley High this isn’t; the girls candidly discuss sexual matters and the language is appropriately smutty enough to realistically convey the, uh, unique vernacular of many teenage girls. Unfortunately the writing can be uneven at times, with the first episode in particular missing the mark more often than not. Often the show will resort to puerile humour merely for the shock value and this fails to rest easy with the more restrained jokes that do hit the mark; it’s almost like the gross out gags are Some Girls’ attempt to corner the same market as the aforementioned Inbetweeners but they feel incredibly forced at times and detract from the show somewhat. Credit must go to the cast though, for even when a joke bombs their commitment to the scene ensure that the audience remains engaged. Initially the characters are rather thinly drawn and, in Holli and Saz’s case, downright unlikeable, but by the third episode the writers seem to have pinned down the personalities and the girls become multi-faceted characters rather than caricatures. By the final episode, the brash and brazen Holli had become my favourite member of the quartet in stark comparison to my sentiments when I started out with the series. Viva’s genitalia fixated brother and her fireman father (Colin Salmon) serve up some of the better jokes in the series, and her tenuous relationship with Anna is the impetus for some awkward moments that would be familiar to anyone who’s had to contend with an interloping step-parent. If there is a weak point amongst the cast it would have to be Viva herself; despite a commanding performance by Adelayo Adedayo, as the voice of reason in the group Viva is simply the straight man and subsequently the blandest character. Thankfully the characters of Amber and Holli carry the show ably, although Saz is similarly underused until the episode focusing on her awkward attempts to ensnare a mate. This release contains all six episodes of the first season and the disc transfer is of high quality, with no issues present in either the audio or visual departments. Unfortunately Some Girls is a bare bones release, with nary a special feature to be found. Despite their best efforts, comparisons to The Inbetweeners are inevitable and many may dismiss Some Girls on that basis alone. The show certainly has potential and the inconsistent tone of the first few episodes is all but gone by the close of the season as the actors settle comfortably into their roles, but the writers need to take a few more risks if Some Girls is to stand out amongst the glut of new comedy shows. There are a few nice little touches throughout the series, such as the visual representations of text messages, but the writing is easily the weakest link and I found that my interest was only really held by the strong performances of the cast. With a second season in the works, hopefully the scripts can match the caliber of the acting and Some Girls can realise its untapped potential, but at the moment the show serves only as a brief distraction and nothing more.